Today I had the pleasure of visiting the Southampton Model Railway Exhibition 2016 with Simon. There were many layouts on display at this large and generally well attended fixture in the model railway exhibition calendar. Held at Barton Peveril College, Eastleigh it is one of the best on Hampshire’s coast in my opinion and the visit proved to be well worth the trip. Due to my camera’s autofocus being broken, it’s taking some time to sift through the shots and apologies in advance for some of the grainy images. Once I’ve saved for a new lens, business will resume as usual! 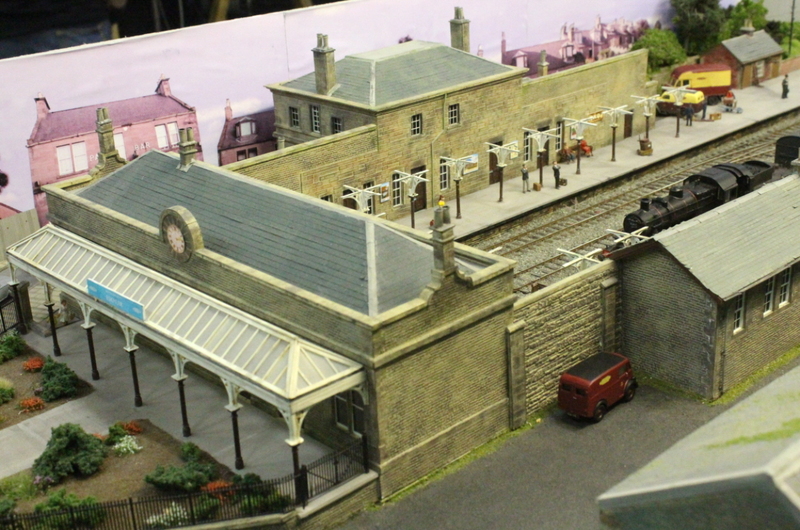 In the meantime, we look at one of my favourite layouts at the exhibition this year – Eskmuir, a layout built by Tony Bucknell of Rochdale. Eskmuir is a 4mm/00 finescale gauge layout representing Brechin in Scotland in the 1958 to 1964 period with the Forfar via Careston line still open and the USAF base at Edzell a major facility. It has some bits of modellers licence applied to allow for better operating potential and a more diverse, frequent and a greater volume of goods and passenger traffic. The points are hand built and power controlled from a master connecting to individual sections that can be separated or controlled together as required. Stock is mainly ready-to-run from Hornby or Bachmann, but there are some kit built locomotives too, such as a Caley 0-4-4T and North British J37 0-6-0. The layout had wonderful amount of small details that makes it hard to move away to view another model railway! The station was particularly special, as it has a magnificent station front, which for me was the icing on the cake. So overall this is a great layout and one to look out for on the exhibition circuit. Loco Yard is on Facebook!